As part of Porsche's 70th anniversary celebration today in Stuttgart, this extra special 911 Speedster Concept was unveiled to the world, and it was love at first sight. 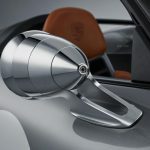 This concept traces its roots back to the first 356 Speedsters, as Porsche has built special edition low-windshield roofless sports cars since the 1950s, most recently with the 997 Speedster of 2010. It's been teased in recent months that a 991-generation version of the open top sports car would be coming, but we had not seen anything beyond speculation until now. While the 997 Speedster was deemed something of a lame experiment at the time, little more than a 911 GTS Cabriolet with a shorter roof yet costing more than twice the GTS, this one appears to have quite a lot more than your average 911 Cabriolet. The front bumper is quite clearly derived from the GT3's, and this Porsche also features a carbon fiber front lid and fenders to shed a few pounds. The Speedster model has traditionally been a motorsport-oriented design ethos, and this concept continues that by ditching the navigation, PCM, and air conditioning system. Like the original 356 Speedster, this model is shown with lightweight form-hugging seats, though modernized fully to the carbon-backed bucket seats Porsche loves to use in their GT models, this time coated in gorgeous throwback Cognac leather. The GT3 Powered Speedster Concept features traditional Speedster cues, as the windshield is lower and more aggressively raked. This Porsche also features a carbon fiber rear lid that covers what would usually be the rear seat area, with a pair of "streamliners" or speedster humps featured prominently in the design. The "b-pillar" is now a contrasting black with beautiful gold Speedster emblems that seamlessly blend modern and vintage. Between the humps is a plexi wind deflector, etched with the 70 years of Porsche logo, that is reminiscent of similar treatment on Boxsters and the Carrera GT supercar of the mid-2000s. Porsche began with the bodyshell of a current 911 Carrera 4 Cabriolet, then added what amounts to a full GT3's worth of suspension and drivetrain bits underneath. Since 2014 we've been shouting that Porsche needs to build a drop-top GT3, and this car finally fulfills that niche! With the GT-department's lovely 500-horsepower naturally-aspirated engine that revs up to 9000 RPM, this open-top two-seater should be a proper ripper on track or on your favorite back road, and rewards drivers with a unique titanium exhaust for a superb sonic quality. The Speedster is, thankfully, equipped with the GT3's lovely 6-speed manual transmission. With a motorsport-inspired livery and stripes package, this Porsche looks properly old school. Add in the throwback design touches, like hood pins, Fuchs-inspired center-lock wheels, a center-fill fuel tank, a talbot-style exterior rear view mirror, and the gorgeous gold badging, and you've got an homage that actually pays it well. I think my favorite part is that this Porsche Speedster doesn't even have a convertible top, instead going for a removable tonneau cover, attached by Tenax fasteners. The Speedster's essence has always been simplicity, and this car has that in spades. It's dedicated to the driver and their experience behind the wheel. No distractions or extraneous bits. While this Porsche is technically a "Concept", Porsche has basically everything needed to make this Speedster a reality currently sitting on their production lines. We wouldn't be surprised to see a production version of the Speedster (likely without the center fill fuel tank, race livery, and hood pins, possibly with smaller wheels. So, in case they were waiting for our approval of the idea, this is our official go-ahead to Porsche. Yes, please build it!